The Brown-1 Lens improves contrast and depth perception. It is an ideal lens for partly sunny to very sunny days. 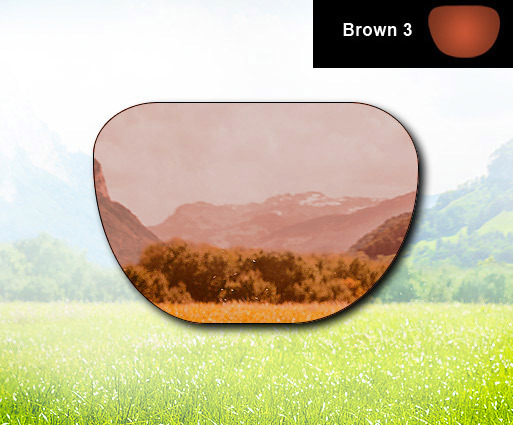 The Brown-3 Lens provides excellent contrast and improves visual acuity and depth perception. This color reduces blue light and is good for highly sunny and varying conditions. Best for driving, golfing, and Water Fishing. The Copper Lens maximizes contrast making items brighter. Ideal for any application where good visual acuity is crucial. Great for fishing, golfing, and driving in varying conditions. The Grey-1 Lens transmits colors evenly and allows for true color recognition. Good for a variety of activities or partly sunny to sunny days. The Grey-3 Lens Reduces the maximum amount of visible light and allows for true color recognition. Good for bright sunny days and heavy glare situations. Best uses include driving, deep-water fishing, boating, and overall everyday use. The Grey-Lens is very similar to the color sensitivity of the human eye. This results in natural vision and true colors that are easy on the eye. It significantly reduces light transmission. Best for driving on very bright sunny days. The Ruby Lens is like watching a sunset on the beach in Maui. This deep rose color increases contrast and is great for activities in overcast or foggy conditions. Ruby is used by skiers, golfers, and on or near the water.